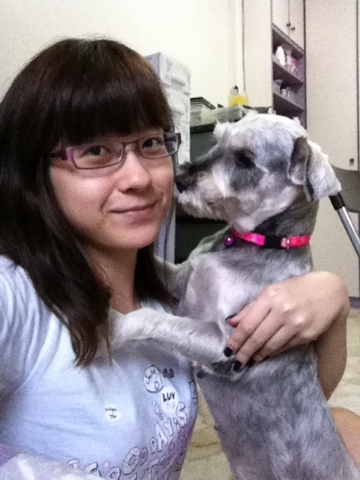 Recently, I adopted a mini schnauzer from an uncle. It’s such a coincidence that he lives nearby my area. the uncle really took care of her very very well. I’m her third owner. she has a very sweet temperament. Or we can say she’s very quiet and lazy. hahaha! but all in all, I really love her! She seems to know I’m her owner cos she follows me almost everywhere. when I went out and came back later, she would stand up at my leg to greet me. She don’t do that to my other family members! she doesn’t bark at all. hmm. trying to make her more active. she’s kinda too inactive. haha! lazy girl!